It is clear when David welcomes you at his door that he loves Homes First! home and it makes him happy. David didn’t want to wait for his bed to arrive before he moved in. As soon as Homes First! had his place ready, he was in the door. Homes First! 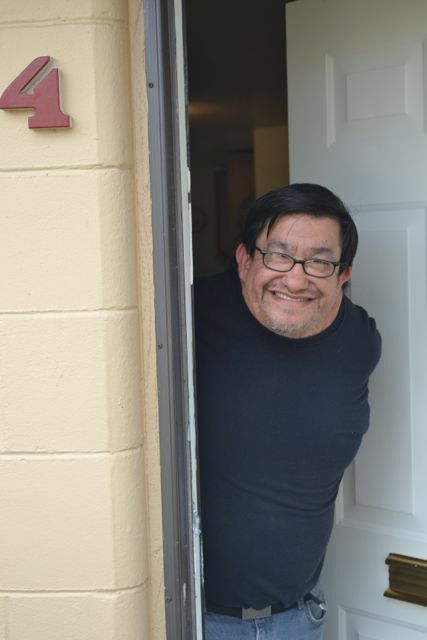 is a local non-profit that owns and manages affordable housing in Thurston County for families that are strapped, those recovering from substance abuse and adults with disabilities like David. “I was surprised that I was on the floor in the morning, but I slept well,” David says with a laugh. Sleeping on the floor hasn’t always been such a funny story for David. It is clear when David welcomes you at his door that he loves his Homes First! home and it makes him happy. His family moved to California where with the help of his parents, hearing aids and some good doctors, David eventually learned to speak and walk. David credits his Dad with teaching him to walk. “He would help me up on my feet,” David explains while holding out his hands as if helping a toddler. As an adult, David was able to work a job as a janitor both in a veterinarian’s office through a non-profit agency, and eventually, when he moved back to Washington, at the UW Campus in Tacoma. But he has had on again and off again living situations, some good, some okay, some bad. Most recently, when he couldn’t bear living in a home any longer where he paid $400 for just two rooms, he moved into a fifth-wheel travel trailer parked in Rainier with his brother and his girlfriend. David was again on the floor, but this time it was in a small cramped space shared with a piece of old furniture in the tiny camper’s living room. He knew he had to find a way out. David and his caregiver, Kathy from Catholic Community Services, spent a lot of time trying to find a new home for David. Homes First! Executive Director Trudy Soucoup and Property and Project Manager, Mike Fouts, explained to David and Kathy there was a one-bedroom apartment available but there were applicants ahead of David. David kept checking back. And checking back. The staff and volunteers worked hard to get the apartment ready for him with new lovely laminate floors and other upgrades, cleaning and repairs. David couldn’t have a better landlord. 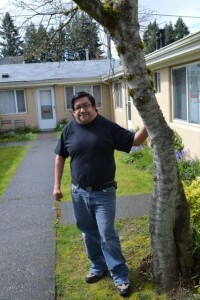 Homes First has helped David stand on his own two feet. His thankfulness is clearly expressed in his care of the place. It is immaculate, cozy and comfortable. 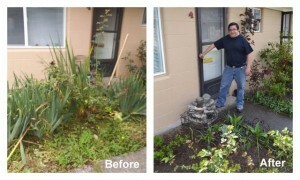 David has weeded flower beds and replanted gardens and proudly shows them off. He takes great pride in all he has accomplished since he has been there. Clearly, Homes First! has helped David keep his promise. The public is invited to an in-home outreach event called “Opening Doors to Homes First!” RSVP online at www.homesfirst.org for the one-hour presentations held on May 20 at 5:30 p.m. or May 22 at 11:30 a.m. Future events scheduled June through August.